whether he lives or dies." community leaders together serving over 110,000 youth and their families. It is based on the unique concept of a one-to-one relationship between an adult volunteer and child who can benefit from the friendship and guidance provided by the volunteer. 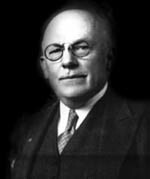 Ernest Coulter is considered the official founder of BB/BSA. Welfare activist, journalist, lecturer, author, advocate for children’s rights are all titles under which Coulter provided years of service to others and gave the nation the organization that today is one of the most influential groups in providing love and guidance to many of Americas forgotten young people. Ernest Kent Coulter was the son of a physician and his wife. After a boyhood life in Columbus, Ohio, Coulter began a career in journalism in 1893 with the Pittsburgh Dispatch, eventually becoming the tri-state editor for the publication. In 1897, he transferred to the New York Herald, serving as a war correspondent in Cuba and Puerto Rico during the Spanish-American War. From 1900 to 1902, Coulter served as the assistant city editor for the New York Evening Sun. Appalled by the suffering and misery displayed by the thousands of children who passed through the court each year, Coulter helped organize New York's first Children's Court in 1902. Specifically created to deal with juvenile cases, the court was created to address the increasing numbers of poor, indigent immigrant youths who were moving through the court system. Coulter became clerk for this special court serving under Judge Julius M. Mayer. human being in this great city who takes a personal interest in him, who cares whether he live or dies. I call for a volunteer." to overcome a stressful situation. With this pledge, the Big Brother movement began and from this group of volunteers, the national organization of the Big Brothers of America was created to provide mentoring to young people in need. largest mentoring organization of its kind. While serving as the clerk in Judge Mayer’s court from 1902 to 1912, Coulter completed his law degree in 1904. In 1908, Coulter was elected president of the Big Brother Organization in New York. The organization functioned by having a full-time representative present in the Children's Court. If the judge felt that a boy could be helped by a Big Brother's influence, the judge would turn the boy over to the representative. The representative would subsequently assign a permanent Big Brother to the child. In 1912, Coulter resigned from his post at the Children’s Court and entered private practice in New York City, where he handled the legal phases of child protective work. His contributions to the Big Brother Movement, however, did not cease. In 1914, Coulter embarked on a nationwide lecture tour to promote Big Brother organizations. Many of Coulter’s other activities also had an objective similar to that of Big Brothers. For example, the Protestant Big Sisters organization received their charter from the New York Supreme Court on June 7, 1912. Coulter served as their attorney and legal counsel and played a major role in the creation of the Big Brother Big Sister Federation. In 1914, he was also appointed general manager and assistant to the president of the New York Society for the Prevention of Cruelty to Children, and continued this position through his retirement in 1936. In 1917, Coulter was elected as the honorary president of the Big Brothers Big Sisters Federation. Additionally, Coulter was active in other children’s protective movements. He was a charter-organizer of the National Council of the Boy Scouts of America. He was an official of the Federated Boys' Clubs. Before World War I, Coulter launched a campaign against drug abuse. Entering military service, Coulter served in the American Expeditionary Force in Europe and attained the rank of lieutenant colonel. Prevention of Cruelty to Children of England. Equally active in many other welfare movements, and determined to make a difference, Coulter lectured throughout the country on subjects dealing with children’s rights. From the experience he had gained in judicial proceedings, Coulter recognized the correlation between adjudicated youth and poor surroundings lacking mentors. He saw that, with encouragement and one-on-one tutelage, young people could experience a life change. True retirement seemed impossible for Coulter. Late lifetime endeavors included serving as director for the Art League of Manatee County, Florida, as well as membership in the American Academy of Arts and Sciences; the Military Order of the World War; the Veterans of Foreign Wars; the American Legion; the New York Society of Military and Naval Officers of the World War; the Ohio Society of New York; the Ohio State University Association; Beta Theta Pi; the Silurian, and the Amen Corner. Ernest Coulter lived a life of purpose. Each passion, each pursuit, focused on one singular mission, the mission to better the lives of humankind, especially the youth of America. With the founding of the Big Brother’s of America, Coulter changed the lives for America’s youth - past, present, and future. He provided disadvantaged youth with something others did not, a chance. “I dwell in possibilities,” wrote Emily Dickinson. Ernest Coulter lived and worked with possibilities, then turned them into realities. The current organization, Big Brothers/Big Sisters of America, is the oldest mentoring organization serving youth in the country and remains the acknowledged leader in the field. BB/BSA currently serves over 100,000 children and youth through more than 500 agencies throughout all of the United States. BB/BSA programs across the nation continue to provide screening and training to volunteer mentors and carefully match the mentors with "little brothers" and "little sisters" in need of guidance. A recent 18 month experimental evaluation of BB/BSA’s mentoring practices found that mentored youth were less likely to engage in drug or alcohol use, resort to violence, or skip school. In addition, mentored youth were more likely to improve their grades and their relationships with family and friends. Ernest Coulter died on May 1, 1952 and is buried in Arlington National Cemetery.